This has been a year of faith stretching, a year of wandering in the wilderness, a year of learning to trust God to provide enough manna each morning to sustain us until we lay down to sleep again. As the months have stretched on, my spirit has grown weary and blistered beneath the scorching heat of suffering and I have struggled to rejoice. But, here as I watch the waves hit the shore, I remember the parting of the sea and God’s mighty hand of deliverance. 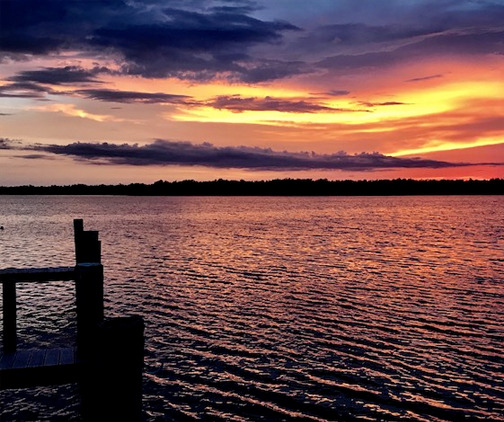 Here, life slows to a crawl and time revolves around cannonball contests and afternoon popsicle breaks, the bobbing of fishing poles and sunset dinners on the dock. I tend to nothing but hunger and exhaustion and the whisper of God’s gentle voice. Here, as I watch the sun fall slowly beyond the horizon, I remember God’s faithfulness and thanksgiving floods over me like salty ocean water. Here, I choose to rejoice.